Luca Pacioli’s treatise on proportions, De Divina Proportione, was originally produced in two manuscripts for Ludovico Sforza and Galeazzo Sanseverino in 1498. The printed version that appeared in 1509 contained engravings of the platonic solids based on drawings by Leonardo. For the first time, Leonardo’s work was published. The platonic solids are three-dimensional shapes made up of polygonal faces, called polyhedra (cubes, prisms and pyramids are all polyhedra). There are five key solids - the tetrahedron (four sides), the cube (six sides), the octahedron (eight sides), the dodechahedron (twelve sides) and the icosahedron (twenty sides). By truncating these forms or adding “stellations”, new forms known as derivatives can be created, in a process of transformation that fascinated Leonardo. Leonardo drew the platonic solids and some of their derivatives not only in solid but also in skeletal form. This technique was highly innovative and beautifully effective as a means of conveying the three-dimensionality of the polyhedra, which are notoriously difficult to draw. 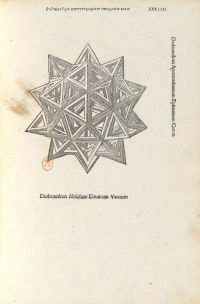 Only the more complex polyhedra shown in the engravings of the printed version of Pacioli’s treatise, one of which is shown here, are based on Leonardo’s drawings.